We are months away from the fall hunting season and you still have some venison in the freezer. 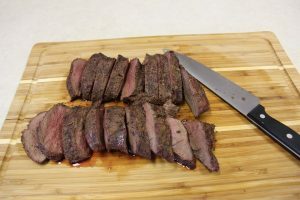 Here are two recipes for venison loin that will have your mouth watering for more, and help you clear out the freezer for the next round of fine eating. One of the best things about hunting is, of course, all the great meat free from preservatives and any other chemicals that might be found in store-bought meat. Wild game meat is organic, it’s “green” and it’s really good! I put three deer in the freezer last fall, and I am lamenting the fact that it’s almost gone. I make a lot of roasts in the slow cooker and a lot of the venison was made into breakfast sausage and burger. I also make a lot of sausage out of bear meat. But one of the best delicacies of all is the loins of the deer. Some people call them backstraps, but whatever you want to call them, they are tender and juicy and delicious. If you fix them properly. I primarily use the loins in two ways and I thought I would share with you how I do it and maybe it will help you enjoy your venison more by taking my advice. Add your comments to this post about how you like to fix your loins, I would love to hear them, I am always experimenting! The first thing I do is pat the loins down with a good venison rub. 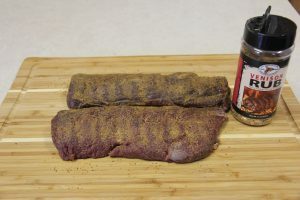 I often use High Mountain Seasonings Western Venison Rub. It turned out great, although it might have a touch too much black pepper for some people. I like to let the loins set at room temperature for 10 minutes or so while the rub soaks in before putting them on the grill. Don’t be afraid to use the rub liberally. Make sure the loins are fully thawed before cooking or they may not come out even. Once on the grill, I cook them slowly at about 300 degrees for around 20-25 minutes. I try to only turn them over once, and then back, but sometimes they need to be turned twice to get an even cooking. I use a meat thermometer to check the interior temperature. I rely more on the interior temperature than on the time on the grill. You do not want to overcook them, this is important. 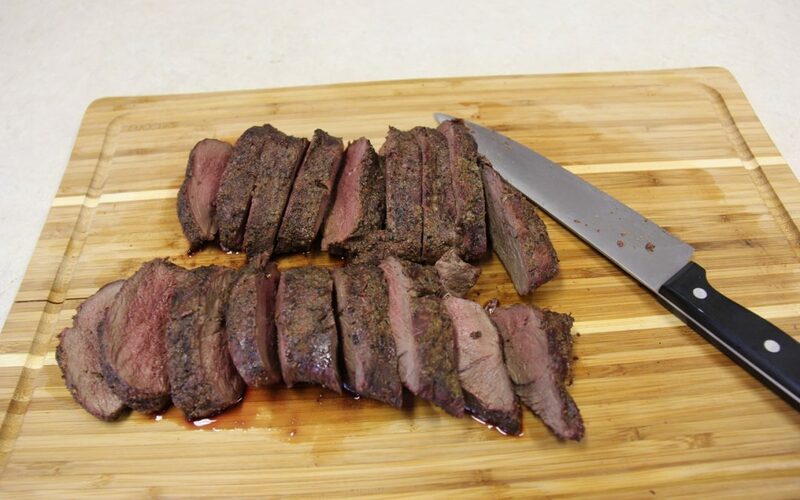 Venison has very little fat content and should not be overcooked. If you like it pretty rare to medium rare, you will want the interior temperature at 135-145 degrees. Well done is 160 degrees, but even if you like most meat well done, you may want to go with a little pink in the middle with venison. It is very lean and if you get it to well done it can be dry. If you let the interior get temperature over 160 degrees, you run the risk of it losing that tenderness that makes it so great. Slice the loins into one-inch thick steaks. The loins turn out juicy and soooo tender they practically melt in your mouth. This is some high living folks. Delicious and so good for you. I make the breading by combing one cup each of flour, cornmeal and grated parmesan cheese. To that I add about two tablespoons of Lawry’s seasoned salt. Mix it up good and spread it out on a plate or large bowl. Then beat one egg into a half cup of milk and put into a bowl. 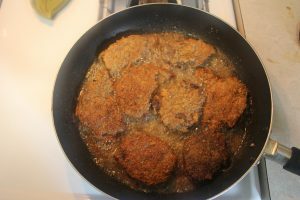 The loins fry best if you flatten them with a meat hammer or at least slice them fairly thin and tenderize them. This allows them to cook all the way through before the breading burns. In a frying pan, preheat oil an inch deep to 375 degrees. Dredge the meat through the milk and egg mixture and let it drip mostly off. Then drop it flat on each side into the breading, pressing down to make sure you get a good coating. Slide the steaks into the oil and fry about three minutes on each side or until each side is golden brown. Be careful with the temperature of your oil. If it gets much over 400 degrees it will start to smoke and burn the breading. If it drops below 325 it will soak into the breading and add greasiness rather than turning it golden brown. These two recipes are guaranteed to be added to your favorites list. It’s hard to beat good venison loin for a meal that pleases everyone in the house. If you use these suggestions, chances are you won’t have any venison in the freezer at this time next year! Next week, I’ll give you two terrific recipes for venison roasts and burger.